Oh it happens again just say it always ends, on a movie screen, a stolen dream comes a castaway of change. Pepper Rabbit is a psychedelic pop-influenced indie band from Los Angeles, California. The group consists of Xander Singh (lead vocals) and Luc Laurent (drums), with Jonathan Allen joining in on bass and keyboard for live performances. Incorporating upwards to eleven instruments on recordings ranging from ukulele, clarinet, horns and an array of analog synths, Pepper Rabbit’s sound can be described as a dense pastiche of baroque pop. Although currently residing in the Los Angeles neighborhood of Silver Lake, the band has roots in New Orleans, Louisiana - where they recorded their self-titled debut album in 2010. 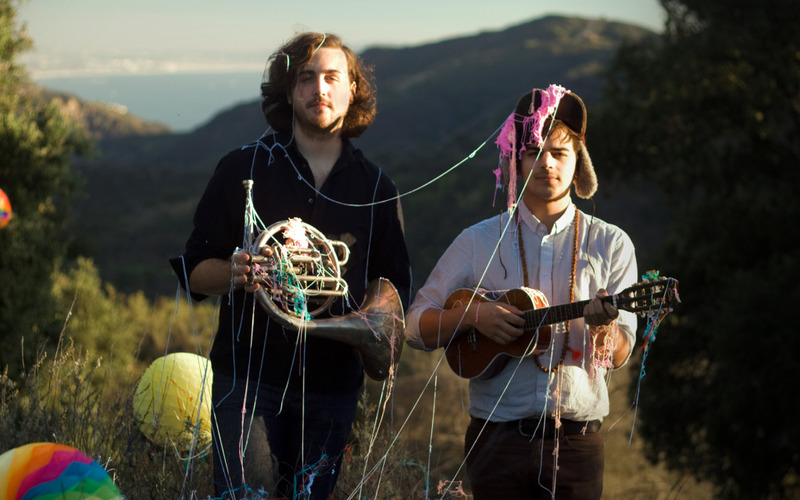 Beauregard was supported by a North American tour several times over including stints with the groups Passion Pit, Freelance Whales, Ra Ra Riot and Givers. Their most recent project, Red Velvet Snow Ball, was released in August 2011. Los Angeles' Pepper Rabbit are Xander Singh and Luc Laurent, but they sound like a pop orchestra, not a duo. They pack their songs with layer upon layer of shimmering melodies crafted from a small warehouse of vintage synths and electric pianos, horns, a legion of stringed instruments from ukelele to electric guitar, washed in stratospheres of electronic effects. You can take it all in at once, or come back again and again and find new sounds packed into the mix. Pepper Rabbit's lush folk-rock immediately brings label-mates Grizzly Bear to mind (and not just for the animal name theme), but their brand of baroque pop is sunnier and more psychedelic, as if Grizzly Bear went to summer camp with The Flaming Lips. The band's 2010 debut Beauregard has some great woozy anthems on it, but their 2011 sophomore album Red Velvet Snowball sounds like they suddenly switched from black and white to color. “Rose Mary Stretch” begins with rhythmically picked acoustic guitar, but doesn't waste any time launching into a spectacularly fun chorus of twinkling keys, hard rocking drum beat and electric guitar, not to mention lead singer Xander Singh's keen sense of vocal hooks. “Murder Room” is pure unadulterated piano pop, bouncing along on squiggly synths and 2011's catchiest piano line before taking a left turn into Animal Collective style tribal fun. Pepper Rabbit’s ability to seamlessly balance experimental flourishes and ever restless compositions with such a perfect pop sensibility distinctly sets them apart. The power-pop leaning singles are great, but Pepper Rabbit also shows a skill for their out of left field deep album cuts. “The Annexation of Puerto Rico” is a slowly building spaced-out acoustic guitar jam that amplifies into a cavernously echoing behemoth begging for an extended guitar freakout at live shows. Album closer “Tiny Fingers” is low key and gorgeous, mixing Bridge Over Troubled Water Simon & Garfunkel with Paper Rabbits' blast-us-to-space effects. Pepper Rabbits are a young band who've already honed their talent and found their sound--catch them before the arena tour. Los Angeles' Pepper Rabbit are Xander Singh and Luc Laurent, but they sound like a pop orchestra, not a duo. They pack their songs with layer upon layer of shimmering melodies crafted from what sounds like a small warehouse of vintage synths and electric pianos, horns, and string instruments including ukulele and guitar. The band's 2010 debut Beauregard has some great woozy anthems on it, but their sophomore album Red Velvet Snowball released this past August sounds like they suddenly switched from black and white to color. It’s a stunning album of psychedelic-tinged pop, as if Grizzly Bear went to summer camp with The Flaming Lips. Frontman Xander Singh spoke with us from his home in the Silverlake neighborhood of L.A. a couple of days before heading out on their current national tour. Band of the Day: Question: Pepper Rabbit songs are very complex with lots of layers, is it tough to get these songs into a live setting? Xander Singh (Vocals, Guitar, Keyboards): This time around it's been a bit easier than when we tried to play the songs from the first record live, because we were still trying to learn how to present ourselves in a live setting. Now that we know what kind of show we want to put on -very high energy- it was a bit easier. We had been thinking about it for a long time, how we wanted to play the songs live. It's been going really well, it's a lot of fun playing songs live. We toured a whole lot on the first record and towards the end of the touring cycle it wasn't boring playing the old songs live, but we were hungry to start playing the new stuff live. Band of the Day: Do you try to recreate all the layers and instrumentation live or try to keep it sparse? Xander: It's a bit of a mix of both, we use a lot of looping and samples to fill out the sound, but we can't drag everything that we used in the studio around the country in our van. So you do have to find new avenues to fill the room with as much sound as we'd like to. For instance, if one part in a song that is very orchestral and has lots of stuff going on and lots of voices and we can't bring a twelve piece band on the road, we try and bump up the energy, maybe loop a few vocals so it sounds a bit bigger. There's definitely a process of trying to recreate a certain feeling of a part of a song that we did on the record. Band of the Day: You recorded the new album in a studio, was there any reason you wanted to do it in a studio rather than at home like the first album? Xander: Definitely, I did a good amount of the new record at my little home studio, but we did most everything in an actual recording studio outside of Seattle. We wanted it to sound really good, a bit cleaner, and I'm not that good of a recording engineer. So I thought I'd take it to a professional! Band of the Day: I hear a lot of various influences you don't usually hear in indie rock, horns, orchestration etc. are there any genres outside of typical pop that you draw inspiration from? Xander: I've always been a big of any music that has a vocal in the forefront, like soul and R&B singers from the 60s and 70s where the music was really just a support system for the lead vocal. I got into music because when I was growing up I did music theater and that's when I really found out that I loved to sing. It's probably not the coolest thing to talk about, but with show tunes you have to be really expressive with your vocals because you're telling a story to an audience. My sister listened to a lot of opera growing up, and that whole genre really grabbed me, because once again, the vocals are the pieces of music that make you feel something. That's one thing I tried to do on Red Velvet Snowball, put a lot of focus on the lead vocal. Band of the Day: You've been talking about the importance of a strong, forward vocal melody. Are there any songs like that that you think are especially great? Xander: “Ashes to Ashes” by David Bowie. I think the vocal melody in that song is genius, it moves perfectly with the music. It's one of those rare songs where the vocals are an instrument that sits in with the music itself but at the same time stands out as something brilliant in the forefront of the song. It works in both ways. I don't think i've ever succeeded in doing that, but it's something I hope to do more of in the future. Band of the Day: Can you think of any one song that you wish that you could claim as a Pepper Rabbit song? Xander: Tons! As of this week, the song “Use Me” by Bill Withers, it's the song I've listened to the most in the past few weeks. The thing that's awesome about Bill Withers is that when you listen to the music it's so simple, even the lyrics are so simple. He's not using any big words or anything, but there's something about it that's like, how did he do that? It's so simple, but it works together so perfectly that it's genius. That's definitely something that I really take notice of because my style of writing is very grandiose and huge, trying to put tons of things into a song, experimenting with the idea of more is more. Using a little too much sometimes, so to really fall in love with a song that is so simple and barebones but at the same time so enthralling, is very cool and definitely a style of writing I'd like to explore in the future. Band of the Day: You used to work at a store that sold vintage instruments, did that influence your instrumentation choices? Xander: Yeah definitely. I did everything from selling things to rearranging the store to delivering certain pieces to well known musicians to their studios. After the first week the manager broke down payment for me and said listen, we can either pay $6 in cash under the table or $10 an hour in store credit. I figured I'd be spending most of my money at the store anyway, so I might as well take the store credit, it seemed like a better deal! And they always had this weird stuff I'd never seen before and it piqued my interest, eventually I started taking stuff home with me and figuring out how to play it. Band of the Day: Anything special that had history from famous musicians? Xander: I brought home a synth that belonged to Wes Borland, the guitarist of Limp Bizkit, I'm sure I used it in a very different way than he did! Oh and the biggest thing is I have one of Jon Brion's old pianos. He's always been a favorite of mine. He'd come into the store and trade stuff in, and one time he brought this little piano. And I took that home and it's been sitting in my living room for the past few years. Actually a lot of the new record was written on it.